Here is a chart of (what I hope are) all deployed and future space observatories showing their orbits, spectral bands and a graph showing spectral coverage vs. angular resolution for many of them, plus some ground based telescopes for comparison. A list with links to the mission websites is below. The data are available on my space exploration history GitHub repository. 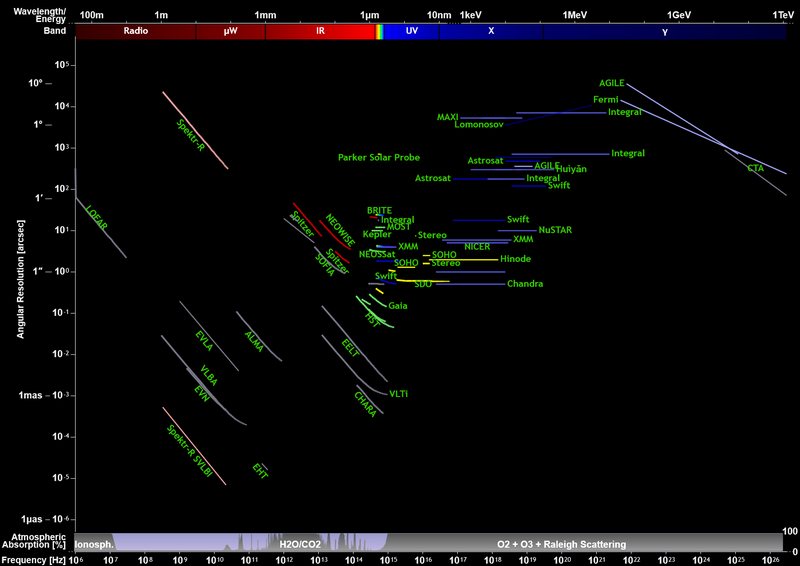 On top is a schematic view of the orbits of all listed space observatories and their main spectral ranges. 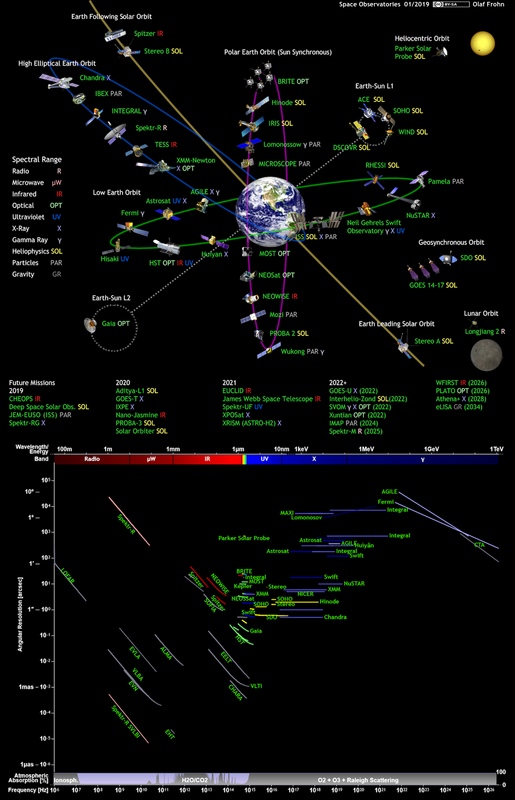 The markers for spectral coverage show only the spectral range for its primary instrument, many missions include a more diverse set of instruments, e.g. the Hubble telescope has a range from near infrared to near ultraviolet. See the spectrum graphic above for more detailed coverage. Solar observatories usually have a variety of instruments, covering not only electromagnetic radiation (in extreme ultraviolet, mostly) but also solar wind particles and magnetic fields, therefore they are marked as a separate category. The chart is of course not to scale, especially the orbital planes are ordered by broad category. In reality all of these telescopes have their own orbit, but I'm trying to give a general overview here. More detailed information is available from CelesTrak. For a detailed treatment of angular resolutuion, see below. Not covered: Balloon telescopes and ballistic rockets, because those cover just about every wavelength above radio and generally last only a short time. The atmospheric absorption graph is shown to indicate where ground-based observations are even possible. It features absorption data from Mauna Kea/Hawaii, so it represents a best-case scenario for observation windows into space. At the low frequency end, radio waves are reflected by the ionosphere; in the sub-millimeter to near-infrared range there are a wide variety of absorption bands from atmospheric gases, mostly CO2 and water vapor (H2O); and the high frequency range above nearest ultraviolet is absorbed by Oxygen (O2) and Ozone (O3) as well as Rayleigh scattering. Only the very highest energy photons above 100 GeV are interacting with the atmosphere in a way that can be observed from the ground, this range is covered by Cherenkov telescopes. Angular (spatial) resolution: the smallest separation at which two distinct objects can still be distinguished, measured anywhere between degrees and microarcseconds (mas). Applicable to imaging instruments that produce a two-dimensional intensity map, in the most generic definition. In combination with distance it becomes spatial resolution. Intensity resolution (sensitivity): The faintest source that can be distinguished from background noise. This is in principle applicable to all remote sensing instruments. It is, however, dependent on the kind of digitalization used and defined in many different ways for different sensing technologies, and therefore not easily comparable across the spectrum. Temporal resolution: The shortest interval in time a change in the signal can be detected, from seconds to microseconds. This is only applicable to specific instruments used for eg. stellar seismology, finding exoplanets or gamma ray burst monitors. Or more generally recording light-curves, the change in intensity over time. Polarization resolution: In degrees, also for specific instruments and with limited application. Angular resolution seems the one best comparable across the whole spectrum, and it is also the most important for what is traditionally thought of as a "Telescope." But the trend goes toward optimizing instruments for more than one capability, like imaging spectrometers. What the future may hold can be gleaned in this entertaining article. The given quantities in the chart show the lowest possible resolution for each instrument, except for interferometry, where more than one instrument takes part, and a very high resolution can be achieved. This is most relevant for space VLBI (SVLBI). The relevant missions are therefore represented by two lines, one for the intrinsic resolution of the instrument alone and one for the maximum resolution by VLBI with ground-based instruments. For the low-frequency end, angular resolution is exclusively defined by the diffraction limit sin θ = 1.22 * λ/D, where θ is the minimum resolution in radians, D the aperture (diameter for spherical instruments, max. distance for interferometry) of the telescope and λ the wavelength, both in identical length units. The factor 1.22 comes from the typical diffraction pattern of concentric rings of a circular aperture and stands for the position of the first dark ring of the pattern. Note that this is a defined quantity and can vary for different optical geometries, but the results are mostly similar and so I have used this value as an approximation for all covered instruments. Approaching the visible frequency range, the diffraction limit becomes smaller and other limits become prevalent, like the pixel-size of the imaging CCDs. For ground based instruments (and SOFIA) atmospheric disturbance is the most limiting factor, where only recently improvements like adaptive optics or lucky imaging allow interferometry to lower the diffraction limit. Space telescopes in the infrared and visible range however are always diffraction limited below a certain frequency that is determined by the properties of the imaging system. At even higher frequencies only the imaging technology limits the resolution. In the X-ray range the most often used grazing incidence telescopes have only a small frequency dependence of their resolution, but are more sensitive to off-center angle of the source, so the given line is the best possible resolution and is mostly constant across the spectral range. At least that is how I interpret the available documentation and hope I'm right with this. In the highest frequency range, at gamma rays, imaging is achieved by tracing photon paths, similar to particle accelerators, and here again the possible resolution improves with frequency. Great job. Only in L5 is Stereo B. Great! Do you perhaps have a higher resolution ones available? e.g. for making an A2 sized poster? For A2 it is ~200dpi, should be enough.